Street food vendors are an essential part of Istanbul’s urban make up. Simit, pilav, barbecued sweetcorn, roast chestnuts, fresh seasonal vegetables, grilled fish sandwiches, kokoreç (grilled, stuffed intestines), stuffed mussel, but perhaps the most welcome sight of all is the köfte (meatball) vendors.. After soccer games, during concerts, on the way home after a tiring day’s work, during a night out drinking, or when you face a hunger crisis at midnight… Whenever you seem to really need something filling and tasty, there’s always a van that has cleverly been converted into a mobile meatball restaurant. Orjin Köfte by Foursquare user Yılmaz O. A minibus painted yellow and red (significantly the colors of Galatasaray football club) is a favorite of many. Until the popular football team’s former stadium was demolished, Galatasaray fans had the unique pleasure of enjoying meatballs from Orjin Köfte. Yet while the stadium may no longer be there, Orjin Köfte is still open daily between 6-11pm and the ever present queue says it all. A photo of meatballs being prepared in Köfte Arabası by Foursquare user Çağdaş G.
Köfte Arabası is an old green van, packed full of taste. Based in Mecidiyeköy, it welcomes the meatball-lovers from all parts of Istanbul and is famous among locals. Istanbulites travel from far wnad wide to sample the succulent meatballs here. Pay it ia visit and you’ll find out why. Köfteci Selahattin by Foursquare user K O. Another equally famous taste destination, Köfteci Selahattin provides a delicious experience right on the shores of the Bosphorus shore It’s one of the most interesting and delicious dining options along the shores of Bosphorus, lacking the pretentions of the fancy restaurants the take up most of the prime shore space. Take a breath, watch the view, and enjoy your meatballs! Köfte vendors are on the Anatolian side as well! Serving out of Kalamış, for 25 years, Mustafa Usta has earned his living from Rüştiye Köfte & Et. While you are waiting for your meatballs to be prepared, you can watch the harmony of colors of the vegetables studiously aligned on the bench. Make sure to try his delicious beef steak too. Note: The meatballs prepared and cooked by street vendors in Istanbul are called “tükürük/ tükrük köfte” (spitball). Keep calm, the name is absolutely not related with the ingredients! İçli köfte or kibbeh is a special type of meatball with many different variations. It’s originally derived from Arabic cuisine and its main ingredients are a bulgur (cracked wheat) shel, and a crumbly interior of minced onions, finely ground meat, walnuts and Middle-Eastern spices. Ali Usta and his family moved to Istanbul from Kahramanmaraş (a city in southeast Turkey) in 1987. Ali’s wife made the içli köfte Ali sold them in a small cart on İstiklal Caddesi. After years of work, they have now opened their own restaurant but Ali Usta still sells his içli köfte from his cart right by the entrance of their restaurant. 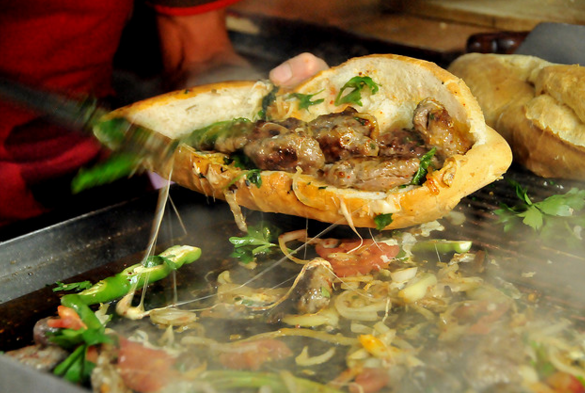 If you have any questions or comments about street food in Istanbul, feel free to drop a comment below. I will be happy to help! Also, don’t forget to share this appetizing post with your friends. Bon appetit (or afiyet olsun as we say in Turkey)!